The green bond market may grow a modest 8% in 2019 despite slowing global issuance in bonds overall, S&P Global Ratings said in a Jan. 29 research note. 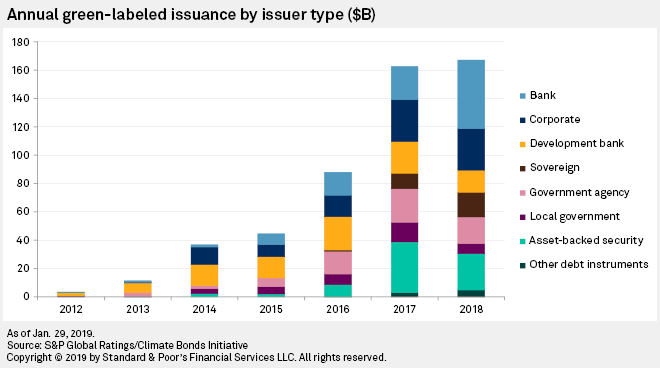 Strong market fundamentals and a continuous stream of new issuers and financing instruments may push annual green bond issuance to around $180 billion in 2019 from the previous year's record $167 billion, the note said citing data from the Climate Bonds Initiative. Issuance from financial institutions was the primary driver of growth in 2018. "We expect financial institutions in particular to continue to increase their share of green bond issuance in the coming years, as investment needs for the transition to a low-carbon economy increase," the note said. The analysts also said increasing investor interest in environmental, social and governance, or ESG, investment strategies has prompted growth in sustainability-related fixed-income products. The analysts expect the rise in the issuance of sustainability bonds to continue in 2019 because of the ESG movement. The gradual tightening of monetary policies in Europe and the U.S. is "triggering a shift in the credit cycle" and contributed to a 3% to 4% decline in global absolute fixed-income issuance, the note said. This also impacted green bonds but did not keep them from growing slightly — but far less than initially projected — by 3% in 2018 compared to the rapid growth of 85% seen in 2017. Bonds are a form of debt securities used to finance or refinance projects in which an issuer such as a corporation, municipality or a sovereign government borrows money from investors for a defined amount of time at a variable or fixed interest rate. A green-labeled bond means that the issuer has earmarked the proceeds to go to new or existing projects that meet specific environmental objectives such as offsetting carbon dioxide emissions. The note recalled that U.S. municipalities slowed their issuance of green-labeled bonds after the tax code was revised in 2017, "which significantly reduced issuers' ability to refinance their existing debt." Although nearly 40% of new green-labeled issuance from financial institutions in 2018 came from China, most of last year's growth came from financial institutions in Western Europe and North America thanks to new issuers coming to the market. The analysts expect Europe will remain the dominant region for green bond issuance with the majority of the proceeds allocated to the energy, transportation and building sectors. And for a growing number of sovereign issuers, green-labeled bonds have become a new tool to finance the country's green strategy. In the past two years, sovereign issuance grew by more than 60%. The S&P Global Ratings' note can be found here.